The following are excerpts from my Master's thesis, which focused on the subject of Slow Design and culminated in the design and prototyping of a human/electric hybrid vehicle. Click here to download the complete document. Trimtab is a 3X3 human/electric hybrid vehilce designed for intracity travel on conventional roadways. It is designed for intracity commuters whose commute is too long or whose fitness level is too low for a conventional bicycle. Like its namesake, the Trimtab is intended to steer these users toward a healthy and sustainable commute. 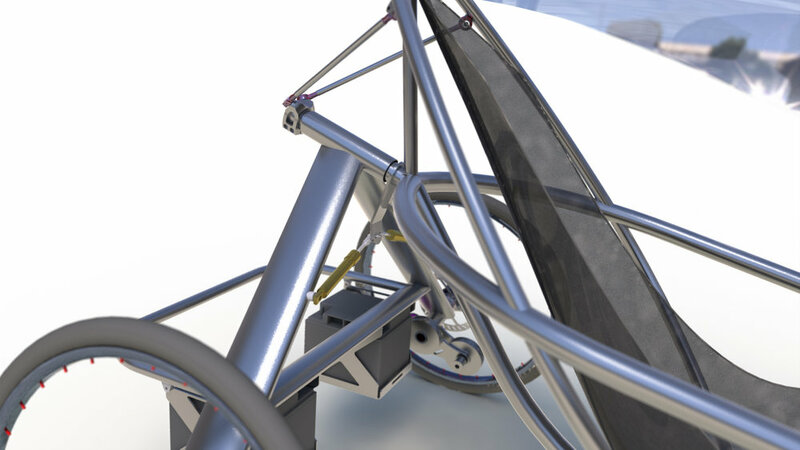 The vehicle is designed with a lightweight, tubular frame made from aircraft grad aluminum. It uses modular fabric skins to provide different levels of protection, seasonally — insulated for winter, breathable for summer, waterproof all-year-round. Trimtab is lean-steered with control handles to provide an exhilarating driving experience. Conventional automobiles contribute to traffic congestion, urban sprawl, community isolation, global warming, obesity and respiratory diseases, traffic deaths, and many other problems. The answer to efficient, healthy low cost, and zero pollution transportation over intracity distances is simple — the bicycle. But most of us aren't fit enough to bike to work everyday or confident enough to ride in fast-moving suburban traffic, nor do we enjoy riding in bad weather. There is an opportunity for an intracity commuter vehicle that combines human and auxiliary power in am efficient and versatile package that takes the edge off of bicycle commuting. The images below are from a short effort to identify areas of potential weight savings for the finished prototype. During this process, a Gephi network diagram was created to document the connections (between parts) that would require design changes if one or the other part was modified. Every part was then analyzed for weight, and the nodes of the diagram were sized to reflect that weight. This process roughly illustrated the cost — in terms of design changes — that would be required to save weight in each part. This process identified parts with the greatest potential for weight reduction that would require the fewest changes to the vehicle. This image shows an exploded view of the vehicle, without skins. To identify areas for cost effective weight savings, the weight of every part was estimated. Physical connections to other parts were mapped to identify potential repercussions of a design change. This diagram indicates that the greatest weight savings can be achieved with no modifications to the vehicle — by having the user ride the device to lose weight. The images below were taken during the process of prototyping this device.